One of the finest school buildings to be built in Scotland, the Ferguslie Half-time school at Maxwellton now stands derelict. Gutted by fire and further destroyed by gale-force winds, only vestiges of ornate brick and stone walls stand like some ruined Italian palazzo. This building, originally designed in 1886 as a school, was indeed a “palace of education”. Contemporary descriptions of the newly-built school described it as “an exquisite building which will delight the visitor whether he be an educational or architectural expert, for neither pains nor money were spared during its construction”. 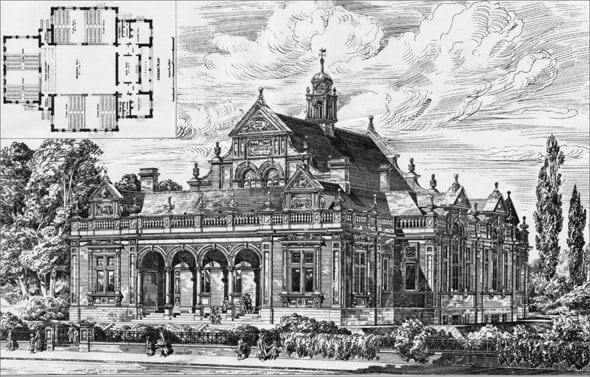 It was also described as “an admirably equipped school” and as “a model of beauty and appropriateness”. The architects of this new school were Woodhouse and Morley. It was thought appropriate by the Coats family to appoint them for this work, as they had, during the 1880s, successfully designed for their clients “the most magnificent cotton mills in Scotland”, at Ferguslie. Without the restrictions of designing a mill building, the architects could afford to “let their hair down” and design the new school in a flamboyant manner and this they did. If the Coats family were the Medicis of Victorian Paisley, the resulting school building turned out to be a little Florentine palace, with architrave doors, carved floral roundels, parapets, white marble panels depicting learning and geography and a splendid polished granite portico or loggia as a grand main entrance. The new building was opened by Peter Coats Jnr. on the 10th of January 1887. The Coats family took a paternal interest in their workers and education had a high priority. For example, in the 1830s, the youngest workers at their mills were allowed to leave work an hour early. This enabled them to attend evening classes in the neighbourhood, to improve their education. J & P Coats opened their Ferguslie Half-time school as an adjunct to the nearby mills. The school could accommodate 400 young girls, all in the employ of the company and all educated to government approved standards. The young female workers would attend this school and work in the mills on alternate days, hence the name “Half-time”. The school was innovative for its time. It boasted well-lit classrooms on the ground floor, with adjacent cloakrooms and toilets. The mill girls were given lessons mainly in the three “Rs”. Nourishing meals were prepared for them in the basement kitchen. A gallery overlooking the ground floor enabled the viewer or visitor to see concerts, plays and recitations performed by the pupils. From its opening, the school took a leading place in Scottish education. Most Paisley families today will recall that they had a grannie or a great grannie who worked in the mills and received part-time education as a half-timer in Coats’ school. The school functioned under the patronage of J and P Coats until 1904. That year, full time education became compulsory for all Scottish children and the administration of the school fell to the Paisley School Board. In 1921, the building, having had various uses, became the East dining hall for the clerical workers of Ferguslie Mills. From 1969 to 1973, the building was used by the mill’s fire prevention team. During this period, the building was also used for evening classes, one of which was the art of fly-tying for anglers! The building was then sold, to become the social club of Ciba-Geigy. After this it became a night club, called appropriately the “Cotton Club”. During this occupancy the building suffered a serious fire, but the damage was limited. This little architectural gem continued in use as a nightclub called “The Institute”. In 1998, Paisley people were horrified when, once again, fire severely ravaged the building. On Boxing Day of that year, gale-force winds caused even more damage leaving the building in ruins. It is hoped that this listed building, which had such an important part in the lives of the “mill lassies” and the young people of today, may be restored to its former glory. It would indeed be a tragedy if one of the last vestiges of the magnificent Ferguslie mills should also be allowed to decay and disappear. Paisley awaits with concern.